The Honorable Robert S. Mueller III, the sixth director of the Federal Bureau of Investigation and the 2016 recipient of the Sylvanus Thayer Award, knows a thing or two about what it means to be a public servant. 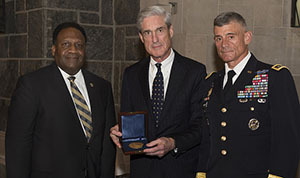 As LTG Robert L. Caslen ’75, Superintendent of the U.S. Military Academy, noted in his introductory remarks to the Thayer Award ceremony in Washington Hall, “Honorable Mueller’s service spans nearly five decades.” It started as a Marine officer leading a rifle platoon in Vietnam. Then, after earning his law degree, Mueller served as a litigator, U.S. Attorney, and the Acting Deputy Attorney General for the Development of Justice. Finally, he was an unprecedented two-term Director of the FBI, sworn in one week before the terrorist attacks of 9/11 and, as Caslen highlighted, “guided the FBI’s transformation from a traditional law enforcement agency to a threat-driven, intelligence-led national security organization that balanced the security needs of the nation with the civil liberties of its people.” During his remarks to the Corps of Cadets, Mueller condensed the lessons he learned during his years of public service to four concepts, punctuating each with a personal story and a summarizing statement to help them remember these lessons as they embark on their own careers as public servants.